Or what? You’ll release the dogs, or the bees, or the dogs with bees in their mouths and when they bark they shoot bees at you? Well, go ahead — do your worst! It’s been a bad year for butterflies, but we’re hosting a regular bee convention! No matter how early the day, by the time I come outside, three or more species are already busily (and, I like to think, happily) working away. 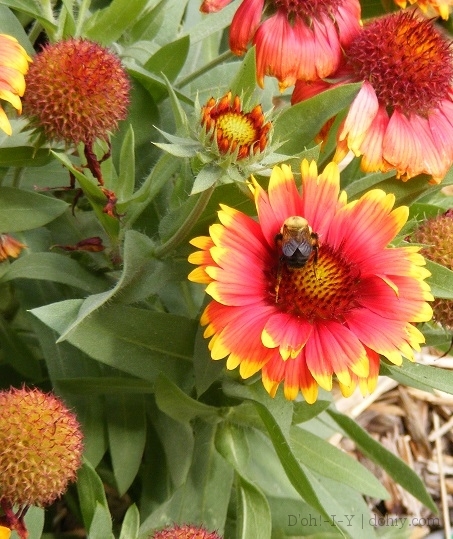 Our “Arizona Sun” Gaillardia is one of the bees’ favourites. 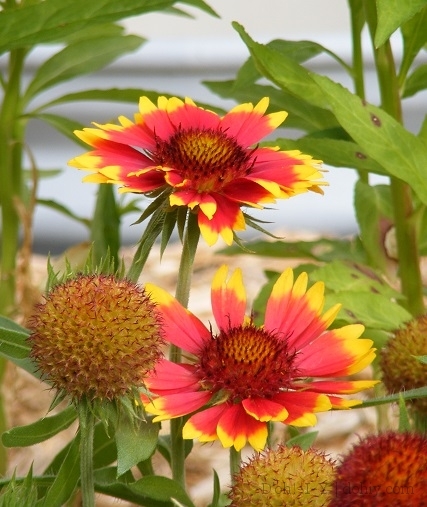 Also called “blanket flower”, Gaillardia comes on strong in mid-summer, and keeps the blooms coming right into fall. Unlike many perennials, it will bloom (and rebloom) in its first year. The “daisies” sport vivid reds, oranges and yellows. The “Arizona Sun” variety is a compact version, but other varieties can be much taller. You don’t have to deadhead it, although doing so promotes rebloom. Even if you leave it alone, the flowers aren’t the only feature – after dropping petals, it leaves eye-catching seed heads that attract goldfinches. A North American native, it’s a sturdy plant and not bothered by much. It’s drought-resistant and widens its immediately area via seed with no encouragement. Plus, not only do you get more from seed, they can be divided and moved or shared every few years. A little frost won’t hurt Gaillardia, and deer generally don’t like them. But the bees are another story. Depending on variety, blanket flower stretches from zone 3 to 11 (US and world zone maps). They spread politely and can be divided. They don’t mind heat and are drought tolerant. As long as the soil drains well, it doesn’t really mind soil differences. Other varieties move into peachier tones (such as the Tokajer), deep red (Burgundy), or citrus shades (including the Oranges and Lemons variety), but they are all easy-going and ever-cheerful. You will like them in a pot. You will like them when it’s hot. You will like them here or there. You will like them everywhere! For more good easy plants, check out Catmint, Clematis and Weigela. 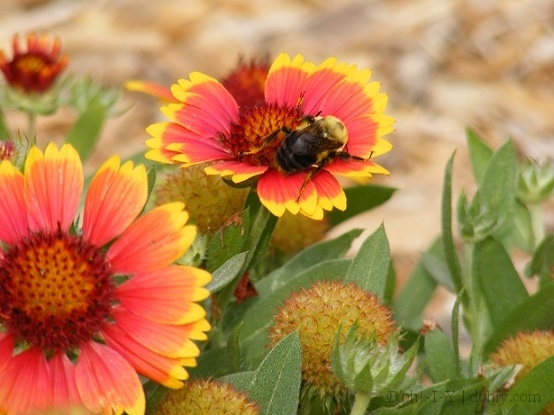 This entry was posted in Yard & Garden and tagged arizona sun gaillardia, blanket flower, flowers that bees love, gaillardia. Bookmark the permalink.